At Gospel Fellowship Community Church, we affirm the orthodoxy (right beliefs) of historic, Reformed Biblical Christianity and the “solas” of the faith. We affirm the orthopraxy (right practices) of Biblical church purpose, leadership, and function. We believe the chief end of man is to glorify God and enjoy Him forever. The following paragraphs are brief, but theologically precise, statements of what we believe and teach as a local church regarding the fundamentals of the Christian Faith. 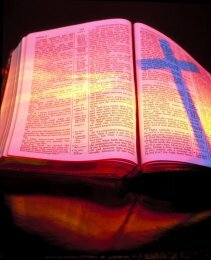 We accept the Bible, consisting of the 39 books of the Old Testament and the 27 books of the New Testament, as the written Word of God. The Bible is the only essential and infallible record of God’s self-disclosure to mankind. It leads us to salvation through faith in Jesus Christ. Being given by God, the Scriptures are both fully and verbally inspired by God. Therefore, as originally given, the Bible is free of error in all that it teaches. A more in-depth statement of our belief can be found in the Chicago Statement on Biblical Inerrancy. There is one God: infinite, eternal, almighty, and perfect in holiness, truth and love. In the unity of the one godhead, there are three persons: Father, Son and Holy Spirit. These are coexistent, coequal and coeternal, yet loving one another in distinct roles of headship and submission. Our understanding of this universally accepted, essential truth is more fully delineated in the Athanasian Creed. God the Father is the Creator of heaven and earth. By His Word and for His glory, He freely and supernaturally created the world out of nothing. Through the same Word, He daily sustains all His creatures. He rules over all and is the only Sovereign. His plans and purposes cannot be thwarted. He is good and faithful to every promise, working all things together for good to those who love Him. In His unfathomable grace God gave His Son Jesus for the redemption of His elect. He decrees that all creation will exist for the praise of His glory. He is to be loved, honored and worshipped as God, the First Person of the Trinity. Jesus Christ, the only begotten Son of God the Father, is the eternal Word of God made flesh, supernaturally conceived by the Holy Spirit, born of the Virgin Mary, just as the Old Testament prophets foretold. He is perfect in nature, teaching and obedience. He is fully God and fully man. He was always with God and is Himself God. Through Him all things came into being and were created. He was before all things, and in Him all things hold together by the word of His power. He is the image of the invisible God, the firstborn over all creation and in Him dwells all the fullness of the godhead bodily. He is the only Savior for the sins of the world, having shed His own blood and died a vicarious death on Calvary’s cross. By His death in our place, He revealed the divine love and upheld the divine justice, removing our guilt and reconciling us to God. Having redeemed us from sin, on the third day He rose bodily from the grave just as He foretold, victorious over death and all the powers of darkness, and He appeared to many witnesses, performing many convincing proofs of His resurrection. He ascended into heaven where, now at God’s right hand, He intercedes for His people and rules as Lord over all, and one day He will return for redemption and judgment. He is the Head of the church, His body and should be loved, adored, served, obeyed and worshiped as God, the Second Person of the Trinity. The Holy Spirit convicts the world of sin, righteousness and judgment. Through the proclamation of the Gospel He brings about the new birth, indwells the regenerate, granting the desire and ability to believe the truth, repent of their sins, trust in God’s mercy and confess Jesus Christ as Lord. He unites all believers in faith to Jesus Christ whom alone He has come to reveal and glorify. He is the Comforter who is neither to be grieved nor quenched. He empowers God’s people to bear spiritual fruit as they walk in the obedience of faith. He is to be loved, obeyed and worshipped as God, the Third Person of the Trinity. God made man, male and female, as the crown of creation, in His own image, so that man might enjoy loving fellowship with Himself. Tempted by Satan, man distrusted God’s goodness and rebelled against God’s righteousness. Being estranged from his Maker, yet still responsible to Him, man became subject to divine wrath, inwardly depraved and, apart from a special work of grace, utterly incapable of returning to God. This depravity is radical and pervasive. It extends to his mind, will and affections. Unregenerate man lives in slavery to sin and Satan as an enemy of God. Fallen, sinful man, whatever his attainments in this world, is lost and without hope apart from salvation by faith in Christ. Jesus Christ is the gospel. The Gospel is the good news that the death of Jesus Christ was a once-for-all substitutionary and propitiatory sacrifice to God for our sins, even as His perfect life provided the righteousness required to be accepted in the beloved. Christ satisfied the demands of God’s holy justice and appeased His holy wrath. He purchased God’s saving grace for all who believe. Jesus Christ is therefore the only mediator between God and man. There is no other name under Heaven by which anyone can be saved. Our ability to respond in faith to this Gospel is itself provided by the free and unconditional selection of God. The Gospel is therefore effective only in those who, by the grace of God, are born again and thereby willing and able to genuinely repent of their sins and place their faith in Christ alone to save them. This Gospel is to be sincerely preached to all people in all nations without bias or prejudice. True conversion is characterized by a new life of love that delights to walk in the obedience of faith and is zealous to do good works that are pleasing to God. Salvation is the free gift of God. In it the righteousness of Christ is imputed to the sinner by God’s judicial decree. Thus justified by faith alone, he is accepted by God and his debt for sin is forgiven. The believer is thus reconciled to God as Father and adopted as His child into His eternal family. He is liberated from the law of sin and death and empowered by the Spirit of God to walk in new life. The Holy Spirit is the indwelling agent in our progressive sanctification. As He shines God’s love in our hearts He produces His fruit in our lives. Our minds are renewed and our actions are conformed to the image of Christ. Though our battle with indwelling sin continues throughout our lives as we are led by the Spirit, we are enabled to walk in the Spirit and so delight in God’s commandments that we truly endeavor to live in this world for the glory of God. All believers are warned by God to persevere in their faith, knowing that they will give an account to God for their every word and deed. The spiritual disciplines of Bible study, prayer, fasting, worship, giving, fellowship and confession of sin are provided by God as effective means of grace to assist us in our pursuit of holiness. Since God has determined that His elect be saved, He has provided all the means necessary for them to take hold of eternal life, steadfast to the end. God’s keeping of His elect and their responsibility to persevere are related as a vine gives life to it’s branches, and so our confidence in His supply necessarily manifests in lives that demonstrate God-ward repentance. The two impulses (the Sovereign’s will for the elect’s sanctification, and their responsibility to perform all of the requisite commands to inherit eternal life) are compleimentary and not contradictory. God by His Word and Spirit builds His Church, calling sinful men out of every tongue, tribe and nation of the human race into the holy fellowship of Christ’s Body. By the same Word and Spirit, God guides and preserves His redeemed as a gathered community. It is not limited to any religious institutions or denominations. Rather, the Church Universal is made up of all who are born-again followers of Jesus. The Church exists in the world to GLORIFY God in ceaseless worship; to NURTURE believers to maturity and EQUIP mature believers for ministry; and REACH OUT to the lost with Gospel of Jesus Christ. New local churches are to be planted in the world as visible evidence of God’s salvation. The church is God’s chosen vehicle for accomplishing the Great Commission: to make Disciples of every nation (see Matthew 28:18-20). Although social transformation is an indirect benefit of changed lives, it is not the primary focus of the church. All members of the Body of Christ are to function as committed members of a local church. In this context they are able to walk in faith working through love, as they obey the Great Commandment to love God and love one another. The ascended Christ has given gift ministries to His Church (including apostles, prophets, evangelists, pastors, teachers, among others) for the equipping of Christ’s body for works of service ( see Ephesians 4:11-14). God has ordained that Elders lead as examples of sound doctrine in action. This is why the qualifications for church Elders are based on a man’s ability to manage his own household well (see 1 Peter 5:3; 1 Timothy 3:1-15). The Elders are called to teach and to pray. They serve as pastors who shepherd the flock and who must give account for the souls of the congregation (see 1 Timothy 5:17-18; Hebrews 13:17). Church Elders are not intended to do all the works of ministry on behalf of the people of God. Elders are to use their offices to equip God’s people to do the work of ministry. Through ministry hospitality and leadership in church gatherings, each Elder is able to teach sound doctrine by example. Deacons are ministers of mercy. They are commissioned, under the oversight of Elders, to respond to needs on behalf of the church. Their primary role is to identify needs in the body and address them by organizing Productive Fellowship activities and dispersing financial assistance. Though women play a vital role in the life of the church, in keeping with the teaching of Scripture, women are not permitted to “teach or to have authority over a man” (1 Timothy 2:12). All church officers must therefore be men. The Congregation also serves a key role in the function of the church. Through faithful attendance, giving and participation in the works of ministry, a congregation can grow strong in the Lord and advance the kingdom of God on earth. God has designed a perfect system of self-sufficiency through cheerful and sacrificial offerings to support the shepherds in their efforts to equip the saints and spread the Gospel. The Lord’s Supper is to be partaken of only by those who are believers in Christ. This ordinance symbolizes the breaking of Christ’s body and the New Covenant sealed by the shedding of His blood on behalf of His people. It is to be observed repeatedly throughout the Christian life as a sign of participation in the atoning benefits of Christ’s death. As the believer partakes of the Lord’s Supper with an attitude of faith and self-examination, he remembers and proclaims the death of Christ,, and signifies his unity with other members of Christ’s body. The future of all things includes the visible, personal and glorious return of our Lord Jesus Christ, the resurrection of the dead and the transformation of those alive in Christ into glorified bodies, the judgment of the just and the unjust, and the fulfillment of Christ’s kingdom in the new heavens and the new earth. In the future, Satan with his hosts and all those outside of Christ will be finally separated from the benevolent presence of God to justly endure eternal punishment in hell, but the righteous, in glorified bodies, shall live and reign with Him forever in heaven. Married to Christ as His Bride, the Church will live in the holy presence of God, giving Him unending glory by praising and enjoying Him forever. Then shall the eager expectation of creation be fulfilled and the whole earth shall proclaim the glory of God who makes all things new.